Sometimes called the ‘Black Pearl Lily’ or ‘Star of Bethlehem’ , Ornithogalum arabicum is an easy care bulb from the Mediterranean area. They are a very reliable spring flowering plant, pearly white flowers are star shaped with dark, pearl like centres, the flowers are fragrant and they will close up a little on dull days. This is a bulb that will naturally multiply to form a good sized clump over time. These are a very easy care bulb to grow in a well drained soil, along with a sunny position, these are the two main requirements for growing this free flowering bulb. Dig soil over well and remove weeds. Add come compost and a little cow manure before planting. Plant bulbs at around 4 cm deep. In very dry spring to summer periods some additional water may be required while the plants are coming into flower. After flowering no additional water will be needed. Possible from seed, however usually by division. The bulbs can be divided after the flowers and foliage have died back in summer. 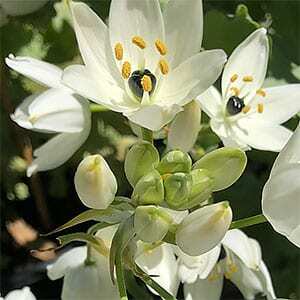 Ornithogalum arabicum are available for sale from the following participating nurseries.